I have always loved to cook and I am fortunate to have a husband who does as well. He is a Top Chef wannabe and is always looking for new recipes we can try. Since I have changed to a healthier lifestyle, we have made a lot of drastic changes in the food we eat. We were a family who ate a lot of processed foods and ate out quite often. We realized not only was this not healthy, but it is expensive as well. We have moved to a more organic way of eating, which includes lots of locally grown veggies, whole grains and organic proteins. Because I am not using a lot of salt and oils anymore, I have learned to cook with herbs for flavoring my food. I am not much of a green thumb, so growing a bunch of herbs is not practical for me. I was frustrated because the fresh herbs at the store were expensive and did not last very long. The other option was to get them dried in a bottle, which was not very appetizing. Then I discovered Gourmet Garden Herbs, which is a whole new way to look at herbs and how I now cook. 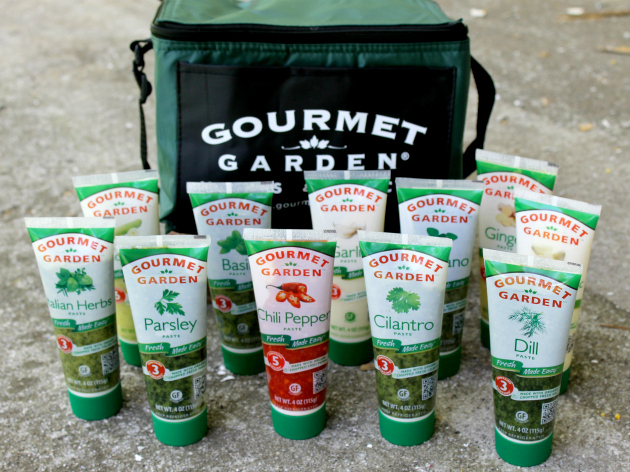 With Gourmet Garden, you get the benefit of fresh herbs and spices in a convenient and easy to squeeze tube. The herbs are organically grown, washed, chopped, blended and packed into the tubes. This process ensures you have all the fresh taste and nutrition of fresh herbs without growing them yourself! What I love is you are buying from farmers who are local to Callide Valley in Central Queensland, Australia. The herbs stay fresh in their tubes for months, so it is much more economical and you are not wasting anything. You can find such varieties as Garlic, Basil, Cilantro and Chili Pepper, and in the fresh produce section of many supermarkets and retailers. 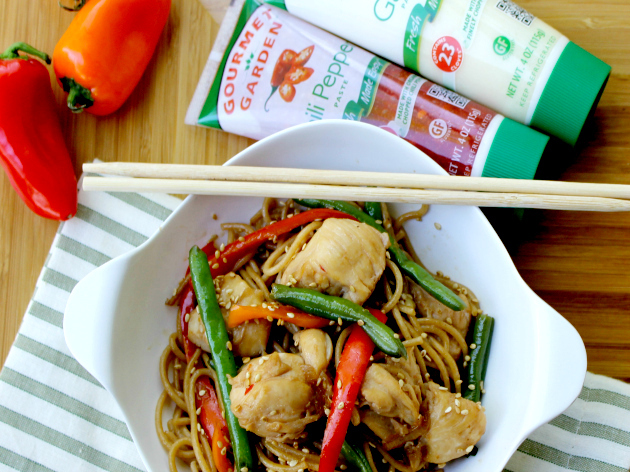 Stay current with Gourmet Garden and follow them on Twitter, Pinterest and Instagram. I was excited to find there is so much more to Gourmet Garden than their incredible fresh and tasty herbs in the innovative tube. You can also find recipes, take free e-cooking classes with real chefs, learn about gluten free cooking and more. To find a recipe, you just choose the herb you want and you get a list of recipes, with instructions and pictures. I took one of the recipes on the website, “Chili & Garlic Stir Fried Hokkien noodles” and changed it up to work with what I had in the kitchen. 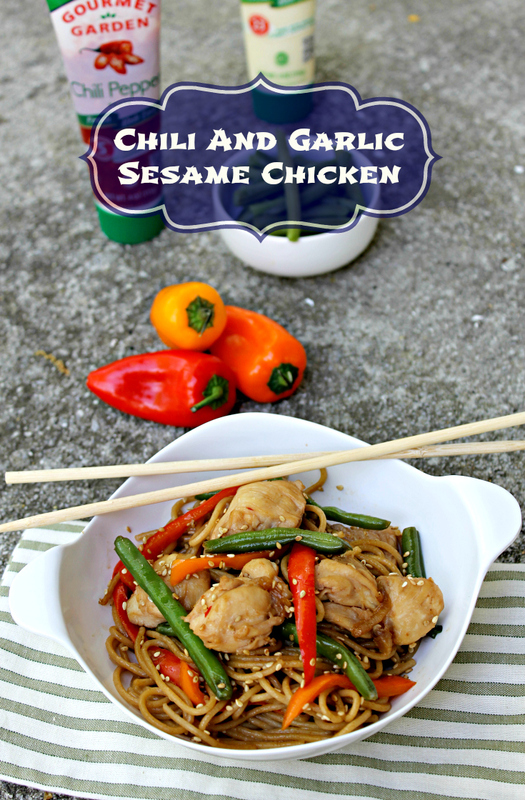 What I came up with is my Chili And Garlic Sesame Chicken. It is super easy to make, only takes about 20 minutes and has a rich flavor with a bit of a zing!One USA reader will win a Gourmet Garden Cooler filled with product ARV $50. Add chicken and cook through, approximately 5-7 mins. Add vegetables, cover and cook for 5 mins. Add cooked noodles, toss and add sesame seeds.